KANSAS CITY, Mo. 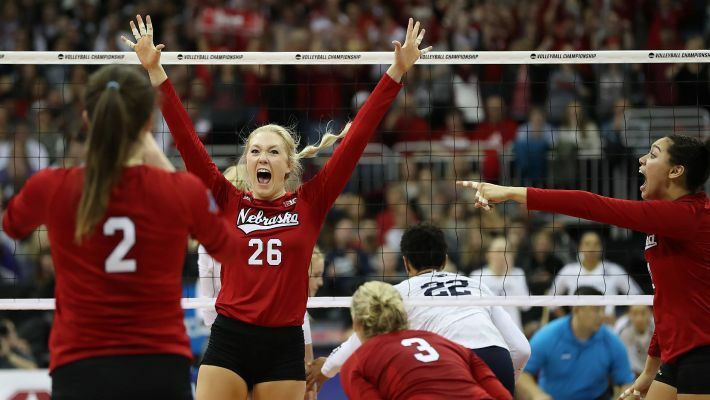 - Mikaela Foecke had 19 kills, Annika Albrecht and Briana Holman added 13 apiece and Nebraska fought off match point in the fourth set to beat Penn State in a five-set thriller in the NCAA volleyball semifinals on Thursday night. The fifth-seeded Huskers will play for the title Saturday night against No. 2 seed Florida, which beat defending champion Stanford in five sets in the late semifinal. The Huskers took advantage of a series of service mistakes by the top-seeded Nittany Lions to beat their Big Ten rivals for the seventh straight time. They also advanced to their eighth title match, where they will try to secure their fifth national championship. Nebraska won the opening set 25-18 before dropping the next two, and then rallied to win the fourth 28-26 and force a deciding set. The Huskers took it 15-11 to advance to the finals.